Latest version of this article is located here. 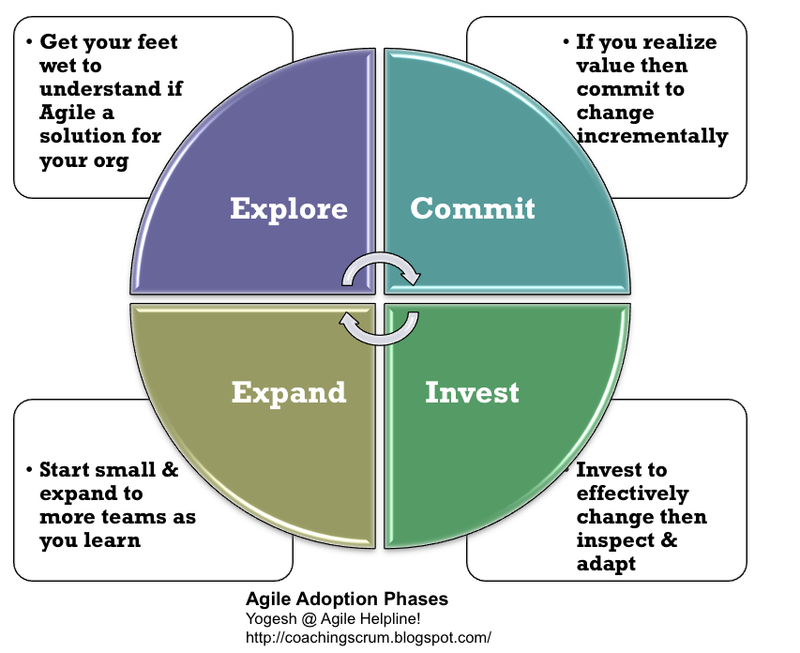 Explore: If a team is new to agile then best way to judge agile is by getting their feet wet. New teams can pick a project and experiment by using various agile ideas to get the feel of the process. Commit: It is important that exploration phase does not continue endlessly. Teams should come to a conclusion if agile will help them achieve their goals more effectively or not. If it helps then team should commit to the agile to truly align with it. You can't yield full benefits by using partial process. 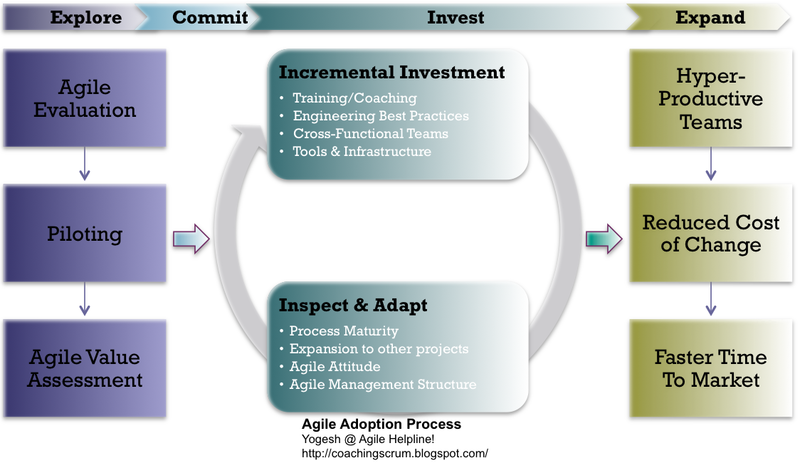 Invest: If a team is committed to use agile then it is critical to invest in the process to effectively implement change. Training & Coaching is one of the key investment. 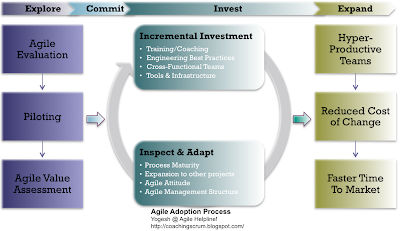 Successful agile teams invest in developing their internal agile coaches. To use agile effectively, teams also need to invest in the engineering best practices, cross-functional teams, tools & infrastructure etc. Key for the success of this phase is to inspect and adapt. 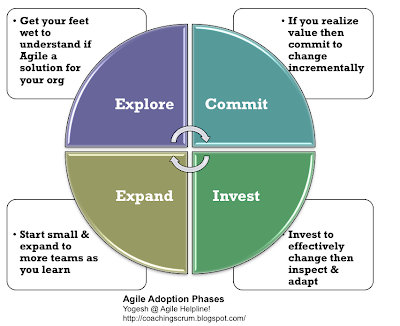 Agile is less of process and more self-realization, hence, adoption process is unique for each team. To get traction teams need to have their feet on the ground and gradually elevate with the desire to continuously improve. Expand: If an organization has big teams, then it is important to start implementation in a small subset. Once this subset goes through the maturity, process can be rolled out to more teams. For more detailed view, you can refer to the following diagram. Simply stating, pilot a project to understand process and its value. Once value of pilot is positively assessed, it is very critical to commit to the methodology to start making incremental investments. After each increment, inspect and adapt to keep increasing the value delivered from the process. Please remember that change is not an easy process, hence, recommended philosophy for change is, "Winners never quit and Quitters never win." General philosophy that you should avoid is, "If you can't change your organization, then you must change your organization".